The Bryn Athyn Church is a congregation of the New Church, and is founded on rich spiritual teachings that bring new meaning to the Lord’s Word, and help readers on their spiritual journey. Our mission is to help people grow closer to the Lord God Jesus Christ. Our New Church Online Store offers New Church and other religious literature and audio-visual materials which explore these teachings at greater depth. The New Church Bookstore serves as a one-stop-shop for Swedenborgian literature, carrying a comprehensive selection of Emanuel Swedenborg’s works, as well as hundreds of titles reflecting on, inspired by, or complementing his theology. These titles include an array of spiritual guidebooks, children’s stories, fictional novels, historical accounts, and complex philosophy. We also stock a beautiful assortment of gifts, greeting cards, and local art. You may order online through the Bookstore online website, or visit us in the beautiful Bryn Athyn Cathedral in Bryn Athyn, PA, USA (M-F: 9am-4pm USA Eastern Time). For information, call 215-947-0266, Ext. 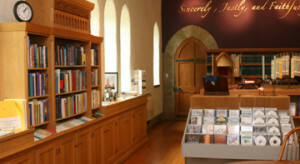 4922 or send us an email at bookstore@bacathedral.org.